All you wanted to know about how railway rolling stock is designed, manufactured, assembled, tested and shipped but were afraid to ask. The late Paul Berkley supplied the original text and it was then edited by me with additional material from Nick Cory. Figure 1: A typical modern rolling stock factory at Derby, where Bombardier has its UK operation. Photo: Author. Railway rolling stock manufacturing consists of a series of stages which begin with the signing of an order and culminate in the entry into service of a new train. These stages consist of signing the contract, doing the design, ordering materials and parts, manufacturing and assembly, testing and delivery. Train manufacture is a costly and time consuming business and there is a lot of risk in the process because a lot can go wrong. Apart from the technical difficulties of designing and building a complex, multi-million dollar project, everyone wants to play trains and interfere with the design, especially politicians and newspaper editors, both of whom have one thing in common - they know nothing about railways. So you want to buy a new train or locomotive? How long will it be before it is carrying passengers or hauling cars? Well, give yourself four years from the date you decide to buy. It can be done more quickly - a new locomotive order in the UK was once famous for having its first loco delivered 18 months after contract signing - but 3 or 4 years is more usual. Here, I am assuming that it is a new design, not a run-on order and that there will be over 80 new vehicles. I am also assuming that you know how many trains or locomotives you need and what the general basic design will need to be. The procurement process will occupy at least a year - add another if you need finance from the commercial market. So let's say you give the supplier Notice To Proceed (NTP) a year after you go to market. The design process will have already begun, since the supplier will have prepared a concept design as part of the bidding process. By the time he gets NTP, he will have got to a stage with his customer where he knows he is the preferred bidder and he will have started more detailed basic design work. Six months after NTP, parts manufacture should start and, six months after that the first body might be ready for installation of its equipment and interior finishes. Give it another year for completion of equipping and a lot of testing before it is ready for shipping. By now, three years have gone already and the first car has still only just rolled out of the factory door. Acceptance testing on site and bureaucratic approvals may last months (at least a year in most European countries) before the train finally enters service. There is some slack in this broad outline because I am sure there will be technical problems on the way but we have used up our four years. Locomotives may take less as each one can operate as a unit and isn't dependent on other vehicles like an EMU (Electric Multiple Unit). 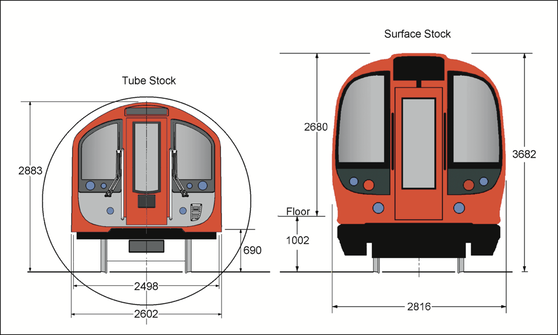 Figure 2: End elevations of London Underground tube and surface stock. Drawing: Author. This is where it all begins. Design work starts during the bidding process. The customer will issue an "invitation to tender" (ITT) and then wait for the rush. Rush? Well, not quite. It starts with the supplier producing an outline design, which is prepared against the ITT and then costed. These days, most manufacturers have created their own catalogue of vehicles that they would like to sell because they can build to pre-existing designs and offer them at a more competitive price. The designs are offered in modular form so they can be customised to suit the buyer's needs. Unfortunately, a contract (particularly one procured by a publicly-funded administration) is rarely as simple as this and, usually, the potential customer will have produced a specification that he wants his vehicle designed to. Invariably, this will not fit conveniently into the little niche of standard designs that the supplier hoped it would. Of course, this puts the price up. Many customers are now trying to procure through performance specifications, where the dimensions, capacity, speed, power requirements and reliability are specified rather than details like the make of door engines or colour of the upholstery for the driver's seat. 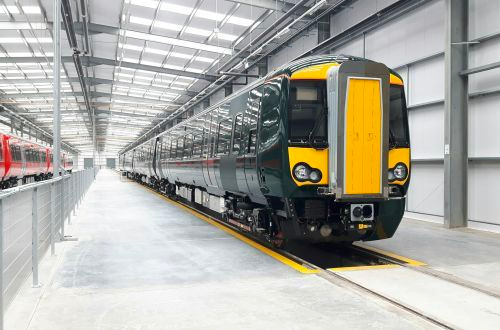 This gives the supplier the chance to adopt standardisation in many areas, but many customers still fall into the trap of asking for a bespoke train and then coming to wonder why it is so expensive. Now, let us assume that the preliminary design was accepted, a price agreed and a contract awarded. The engineering design office (henceforth referred to as the DO - originally short for drawing office) will now swing into action and start developing a plan for the design work of the vehicle, which will include producing a Bill of Materials (BoM) that will identify all the details necessary to manufacture the vehicle. A preliminary list of drawings will be tied in with the BoM and there will probably be in excess of 3000 drawings needed. Meetings will be held with the purchasing and production departments to determine priorities for preparation of designs. Design will be carried out using one or more computer aided design (CAD) packages. These allow 2-D and 3-D modelling and permit the designer to test how items can be assembled or removed for maintenance purposes. Much depends on good design management and on accurate software management. A good CAD system will allow the bill of quantities to be generated and will produce machine tool programmes to be used in the manufacturing processes. During the bidding phase, the DO will contact various sub-suppliers of brakes, lighting, seats, propulsion, traction motors etc. about the specifications, to determine who can, or is willing to meet the performance requirements. Many of these sub-suppliers will have framework contract with the main contractor and will know the levels of quality and production requirements. If you look at a piece of rolling stock, it is easy to see that the supplier is really just an assembler of many parts that are purchased from other suppliers. Perhaps all he has is a specialist shop for manufacture of the car bodyshell and one for the wiring looms, and the rest of the vehicle is bought from others. Some car builders, like Brush Traction in the UK, even buy complete locomotive body shells and bogies from external suppliers. However it is done, the vehicle design and assembly concept will eventually come together and some preliminary design drawings will be produced for presentation to the customer. It is at this point that some long lead items will be ordered. Steel, some types at least, can have a three-month lead time, especially if you want a special finish for an unpainted vehicle. Cables can require a six month lead time, particularly if they are of special fire proof or low toxicity specification. Car interior panels may also require specialist materials with long manufacturing periods. Of course, once you order these things, you are locked into the design, so you'd better be sure you get it right. There is very little room for error as profit margins in the railway industry are very low. You are doing well if you can generate more than 5% on a rolling stock order. The quality of materials is another area that should be given full attention by the rolling stock manufacturer. Apart from the need to meet strength, durability and fire hardness requirements, the failure of a structural component can have serious consequences for the operator and the supplier. It will be expensive for a manufacturer to have to recall delivered car bodies to rectify structural defects, as happened in 2016 in Singapore, where the Chinese supplier has had to repair defective aluminium car bodies. Another area which needs to be sorted out early is jigs and tools. The car body parts will have to be assembled in jigs to ensure that they are held rigidly and in the correct position during welding. The body shell itself will also require a large jig to assist in the assembly. Jigs cannot be designed until the body form is known and the construction methods agreed. A jig is basically either a steel bed, shaped to carry the section to be welded, or it a series of specially formed steel frames, upon which parts will be fixed while they are welded. The jigs will be fitted with adjustable clamps which will hold each piece in its correct position for welding. Jigs come in all shapes and sizes, depending on the part or parts to be assembled and the welding system to be used. Jig design is an art in itself and many a project has been a success or a failure because of the quality, or lack of it, of the jigs. Figure 3: A curved roofing jig, to which the steel parts are clamped to provide stability during welding. The roof is one of the more difficult parts of the car to weld as it is thin and tends to distort easily. Photo: P Berkeley. Some manufacturers have been known to try to cut back on the time or materials allowed for jig design and manufacture. This is always an expensive mistake. If the jigs are not right, the car body won't be right either. It is a sobering thought that, in the last 30 years, every new tube train London Underground has had delivered has not fitted into the tunnels. One fleet had to be rebuilt. Tools are another important item which can be forgotten. If any specialist tools are required - like dies for stamping steel parts, these must be properly designed and manufactured to the highest standards. Specialist tool makers are best for the job. I have seen shop floors littered with rejected stampings and pressings, thrown out because they were poorly made with bad tools and therefore didn't fit were they were supposed to. The early design meetings will culminate when the scheduling department produces a Work Breakdown Structure (WBS), which will map out how the vehicle will go through each stage of manufacture and assembly to reach the final steps where it is commissioned and delivered to the eagerly awaiting customer. The WBS will have to match a time plan, the submission of which is invariably part of a contract these days, and which will contain milestones in the design and manufacturing process which the supplier must adhere to. It will also provide convenient packages for the design staff to work within so that drawings for the production process can be issued quickly for the first parts needed for assembly. If the DO has been lucky, they will find that they are able to get away with only modifying and updating some existing drawing files and perhaps, if they are really lucky, only the drawing number will need to be changed. Of course, life is never that simple and there will be panics and much heart searching as new designs have to be developed within the time frame agreed with the customer and with the production control people in the factory. Once the DO finishes a design package (a complete set of drawings for a specific item of manufacture), it is forwarded by a Configuration Control section to the manufacturing engineering department. Configuration Control is responsible for ensuring that all the drawings and documents connected with the contract are registered, submitted to the customer for approval, returned from the customer in time (they are often not), questions from the customer are answered, that the latest updates to drawings and instructions are passed to the production control people and all correspondence is noted and archived. It may sound bureaucratic but it is essential that all the paperwork is kept up to date and is retrievable in case there is any sort of dispute (and yes, there always is). Configuration Control is also about monitoring the putting together of the vehicle as it gets built - ensuring not just that there are no parts missing but that all the parts fitted are at the correct modification state, both hardware and software. The former is difficult because of the slow rate at which hardware faults always seem to get corrected and the latter is even more difficult because of the sheer speed at which programmers empirically try to debug their products, with sometimes chaotic results. Now the challenge comes: the DO has completed a design package and it is Manufacturing Engineering's turn to look at what has been produced to see if it can be made. Manufacturing Engineering is usually part of a team under the Project Manager who will be ensuring the vehicle is 'coming together', so to speak, and will also include a couple of engineers and draughters to make any changes that are needed. Sometimes it is necessary for the manufacturing department to produce additional drawings that will enable the manufacture to continue without delay. These will be produced in conjunction with the production department. Production Control have the responsibility of bringing all the various procurement and manufacturing areas together and ensuring a completed vehicle comes out of the shop with all the requirements of the customer to the schedule agreed with the customer. To do this, using the BoM we talked about earlier, a schedule will be put together which will show what tasks are to be completed, where, using which machines or tools, when and by whom, in the manufacture of the vehicle. This will show the various work stations, identifying the tasks that will be performed at each station. Production control will also allocate materials, staff and times for each process. Production orders are then produced and passed to the manufacturing shops together with the drawings. There are all sorts of fancy names for "buying" around nowadays; Purchasing, Procurement, Sourcing, Materials Management and so on, but when it comes down to it, buying is what this department does. A manufacturer usually has one buying department which may be split into two sections - one to buy raw materials, the other to buy complete items of equipment. The section buying the raw materials will get their orders from the manufacturing department and will be involved in the purchase of bar stock, sheet plate, nuts, bolts, piping, paint and probably such items as welding rods, glues and mastics. Their responsibility will be to ensure sufficient material is available in the machine shops, the fabricating shop or the paint shop to enable parts to be finished to schedule. They have to do this early in the process. We have already seen how some specifications for long lead items will have been agreed and ordered immediately after NTP. The manufacturer’s section buying the equipment will, for the most part, have a more difficult job and they will deal mainly with the DO. This is because they will be reliant on the DO providing technical specifications to issue to the various sub-suppliers. Sometimes the customer's specification will dictate whose equipment should be used. This makes it very difficult for the buyer to obtain a competitive price, as the sub-supplier will be aware that their equipment is specified by the customer. In any case, the buyer will be under pressure from the DO to identify a supplier to enable designs to be completed and he can become caught in a vicious circle if he is waiting for the specification from another group within the DO. To get a competitive quote, a manufacturer should get at least three quotes. Finding three suppliers of say, a braking system, can be a difficult task and, if it is a boom time for orders and the brake manufacturer has a full order book, getting his attention will compound the problem. But the buyer has to find the right product at the right price, so he will find himself in endless discussions and meetings with the salesmen and engineering staff of the supplier. The DO staff will want to meet with the engineers from the supplier to learn about the physical and performance capabilities of the equipment and the buyer will be expected to attend these meetings to make sure the DO does not 'gild the lily' with the product and increase the price out of range of the budget. 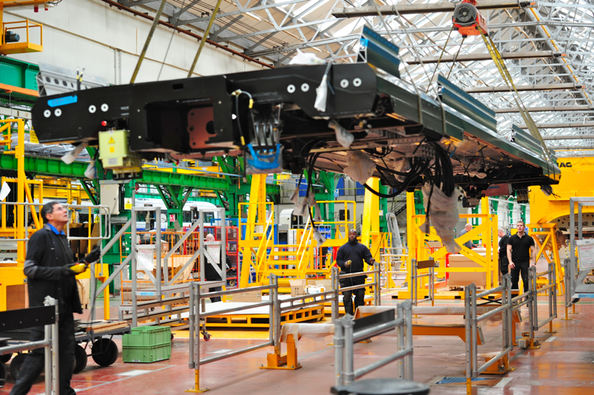 The many parts that make up a locomotive or car body shell will be made in a machine shop(s) either at the manufacturer's plant or be contracted out to sub-suppliers. These parts may be structural members, ribs, bolsters or panels. It is important that the DO designs parts in such a way that they are easy to make and of materials which can be processed by the factory with its existing equipment. It is also important that the parts can be easily assembled to form the vehicle as it progresses through the manufacturing process. The cost of many vehicles has soared because the design of parts has caused trouble for the assembly process by being too complex, too tight tolerances, or too difficult to handle. Curved shapes are the worst and roofing the most vulnerable to such problems. Figure 4: Here is an aluminium bodyside assembly jig and clamp with a section being welded by hand. Most modern bodyside rail vehicle welding is automated using the friction stir welding method. 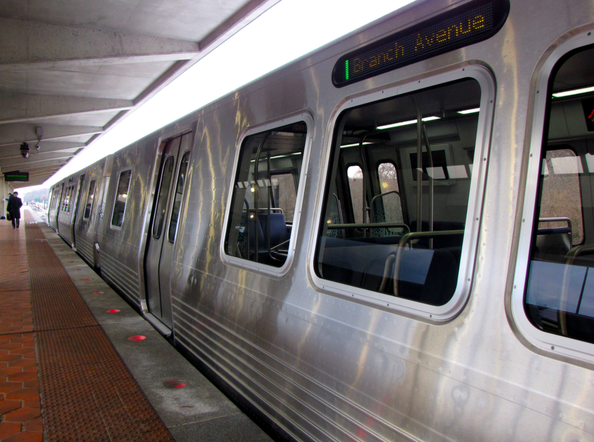 It is common for the body sides of metro cars to be built in short sections matching the areas between door openings. Photo: Bombardier. Once sufficient parts have been manufactured separately, they are brought together for assembly in a jig. The underframe is usually the first part of the bodyshell to be built and its principle parts will include, sole bars, runners, bolsters, and transoms. Figure 5: Traditional inverted steel underframe welding process. 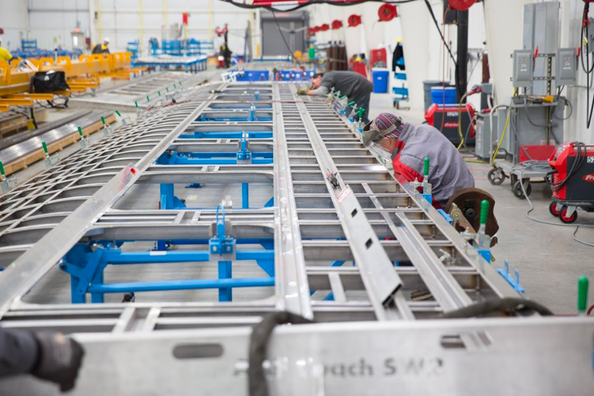 The vehicle underframe will be moved through a series of jigs designed to hold the frame in specific locations to allow attachment of the various components while they are welded into place. The underframe is normally assembled in an inverted state so that brackets and other attachments can be welded easily. The underframe will also be provided with a camber to compensate for loading. Photo: India Times. An important feature of the manufacture of the traditional underframe is the provision of a camber. This is the 'bowing' of the frame along the longitudinal length upward from the ends to the centre. The camber is important because, as all the other structures are added to the underframe, the weight obviously increases. If there was no camber, the resulting car shell would sag in the middle. To see how this works, look at the trailer of an articulated truck that you see on the road and observe the upward bow. Figure 6: A completed underframe being moved to the body assembly area. The fixing of attachments to the underside seen here will have been done with the frame inverted. Photo: Bombardier. Similarly to the underframe, the various parts of the vehicle side will be brought together in a series of jigs for assembly and welding. If it is a car body that is being manufactured, the windows can either be cut out of the bodyside panels or the sides will be assembled in sections with the window frames (called pans) already installed. The most difficult aspect of side manufacture is getting an acceptable degree of flatness whilst keeping the weight of the bodyshell within reasonable bounds. 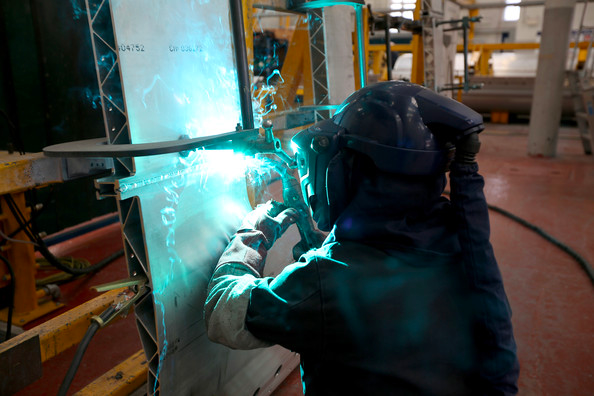 Welding the panels to the frame often causes rippling of the panel due to distortion by the heating of the welding process. Clamping the skin under tension can help but post welding straightening is often necessary. Aluminium double skinned body construction has helped with this problem but welding produces heat and this must be managed carefully in both design and construction phases. Figure 7: A bodyside frame for a Florida high speed vehicle resting on a jig (in blue) while finishing work is being carried out before the side panels are spot welded on. Photo Siemens. Figure 8: Unpainted stainless steel car body as used on the WMATA (Washington) Series 7000 cars. Note the curved corners of the frames of the window pans set into the car body side. The curve in the corners reduces stresses in this area and the risk of tearing the panels. Also, a common feature of US designed rail cars is the horizontal ribbing used as a device to reduce the risk of body panel ripples. Photo: WMATA. 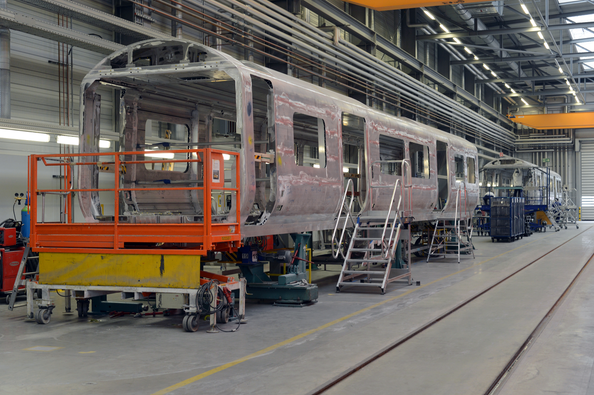 Figure 9: Welded aluminium bodyshells by Siemens for the British Class 700 EMU fleet. In this factory, the shell is completed before fitting out. Photo: Siemens. Figure 10: Traditionally designed stainless steel car body by Siemens in the US for the Florida high speed “Brightline” trains. 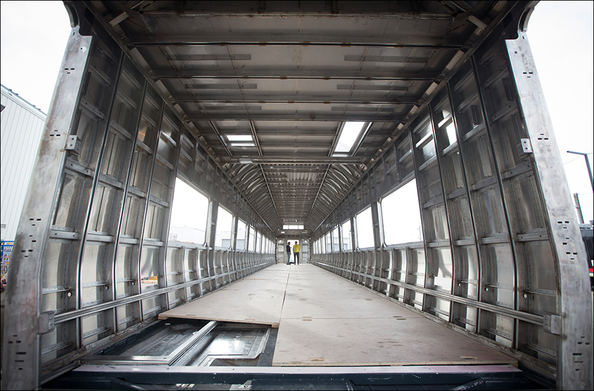 The bodysides are made up with stainless steel sheets, acting as the external cladding, welded on to a pre-prepared frame. Photo: Siemens. Figure 11: The standard method of fitting out car interiors following the completion of the whole bodyshell structure. 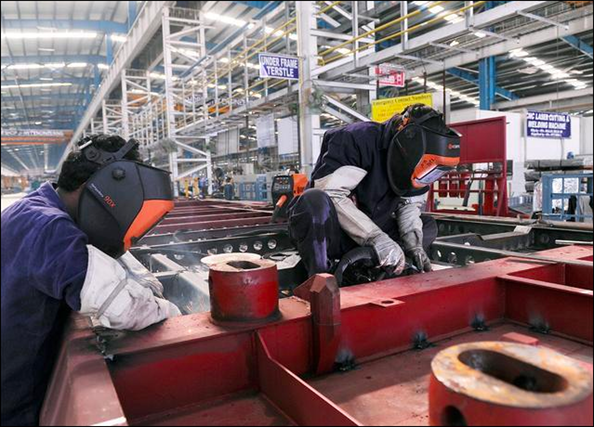 In some Bombardier factories, the underframe, sides, ends and roof of the car are pre-assembled with insulation, ducting, wiring piping and fixings before being brought together in the car body erection area. The sections are pre-painted and some are lined too. The sections are then huck bolted together. The process can be viewed in a series of photos here. For a mechanically fastened body, the roof goes through much the same process as the underframe or sides. Although there will probably be less items involved than, say, the underframe, the curved shape of the roof will require a jig to form the contour. This will be complicated if it is a ribbed section and will probably need holes cut out to accommodate vents, HVAC and ducting. The first roof is always difficult to assemble, since the jig has to be just right as well as all the parts making up the roof itself. Once assembled, the roof may be inverted for the fitting of ducting or wiring. 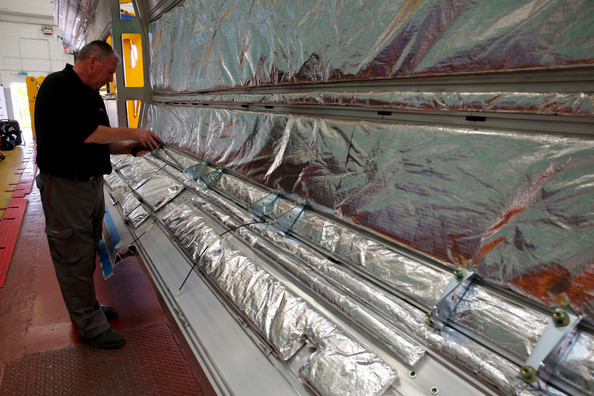 Figure 12: Ceiling insulation being fixed to the inside of a car roof of a Bombardier EMU vehicle. The roof is being held in a special jig that allows easy fitting of interior parts. When the fitting work is complete, the jig is rotated and moved to the carbody erection area. Photo: Bombardier. The alternative system used by Bombardier for bodyshell assembly is to manufacture the body parts and partially fit them out before erection. The video in Figure n shows a time lapse for the process. 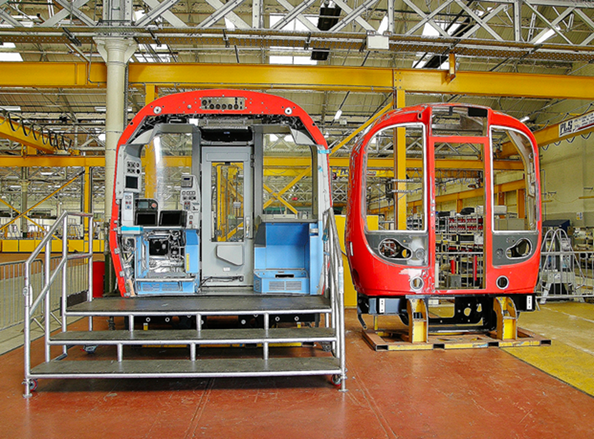 Figure 13: A time lapse video showing the assembly process in their Derby factory for a Bombardier Aventra car for the London Crossrail Class 345 order. The bodyshell is aluminium and is assembled in sections and huck bolted together rather than welded. Video: Bombardier Transportation. When the welding is finished on a traditionally made bodyshell, the completed shell is moved to an inspection and straightening jig. This is where it can get interesting, watching the craftsmen using their skills to straighten the sides. As we have seen, the sides will usually show ripples on the skin due to the tolerance generated during assembly and the expansive effects of welding. At the same time, grinding of the welds will take place to smooth any rough edges. Straightening may involve using a large hammer with a blow torch to heat the skin (heat and beat), or it may employ a more sophisticated method such as attaching a magnetic panel (contoured to suit the shape of the body) to the outside of the skin and a thick panel to the inside, using the magnet as shown below. This 'thick' panel will have a series of equally spaced holes through which heat is applied using a multi-nozzle blow torch. The heat applied has the effect of stretching the skin of the body, due to the spot heating, causing the panels to straighten. Vacuum clamping is also sometimes used. It will be dependent on whether the car has a stainless steel or low alloy, high tensile steel body as to the method used for straightening. It is virtually impossible to straighten a car body which is required to have an unpainted stainless steel finish. In one respect, aluminium is a better material to use for car body assembly. It is light enough that it can be supplied in thicker sheets, which don't buckle during assembly. The straightening process is therefore eliminated. However, it is more expensive than stainless steel and has a lower strength. 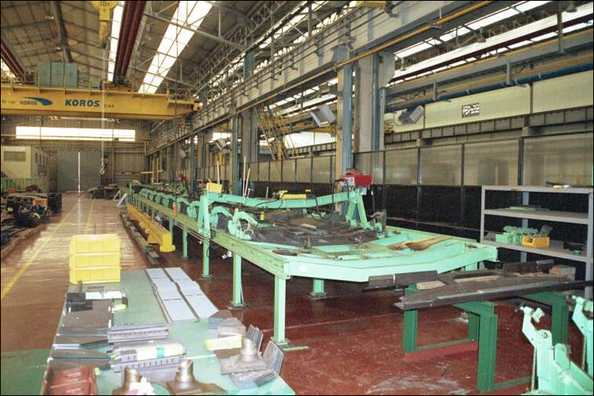 We have seen how the underframe may be turned over or inverted at several stages during its manufacture. As the underframe will eventually carry all sorts of equipment, various brackets, pipes and cable runs need to be attached and, to fit them from underneath is a backbreaking and slow task. To make it easier, once the underframe is substantially complete and before it has the car sides and ends attached, it is inverted again and the extra brackets are welded on and pipes, conduit and air reservoirs bolted or welded on. The modern train will often be designed to have an aerodynamically smooth front end. However, certain crashworthiness standards are necessary, so some protective structure will be needed as well. The usual solution is to construct a steel framework and then mount the smooth, shaped end over it. To achieve the three dimensional curved shape in steel or aluminium is difficult - although the Germans seem to have done it (doubtless at great expense) in their high speed ICE trains - so most manufacturers often use a glass reinforced plastic (GRP) moulding. There are normally made by specialist producers, since the process requires skill, special materials, proper environmental protection systems and careful quality control. Modern assembly methods include building separate car ends. These are prepared in their own area and then added to the main bodyshell at a later stage in the erection process. This can be useful for cab ends, when they can be tested separately before joining to the main body. Figure 14: Cab ends in the Bombardier factory at Derby, UK. These are built and tested before adding to the car body. Photo: A McKever. For some years after World War II, it became fashionable to produce car bodies without painting them. This saved labour and weight and seemed, at the time, to have an acceptable finish. When graffiti began to appear is the US in the late 1970s and in Europe in the early 1980s, it was found that the unpainted bodies were very difficult to keep clean. Attempts to remove the graffiti paint left ingrained marks. Often car bodies became severely damaged. In some cases, cars were painted to try to improve the appearance. The paint used was a special two-pack mixture which was supposed to harden to a graffiti resistant finish. Nowadays, painting for trains has become the norm again and some interesting colour schemes have resulted. A car builder will need to have a fully equipped paint shop and drying facility, together with all the necessary fume extraction and fire protection equipment. An important part of the manufacturing process is how to move things around the works. Modern railway vehicles contain long sections of lightweight materials which, for example, need to be moved from the rolling mill to the welding jig. A 24 metre long steel section needs careful handling if it is not to be ruined by accidental bending while being swung from one side of the shop to the other. It is worth mentioning here that a railway vehicle factory can be a very large place. If you say that a site requires one square kilometre of land, you would be in the right ball park - well, a very big ball park. This means that you have to move things around during manufacture. Very often, large parts, like underframes and roofs are made on jigs in a large shop and moved through assembly jigs to a final assembly jig. Moving a stainless steel roof 24 metres (65 ft) long is difficult because the roof will flex. Secure cradles need to be designed to protect parts which have to be lifted or moved from one area to another. Cranes will be required in all the shops. Overhead bridge cranes are the traditional type used for the larger items like this and a big shop will need at least two. Another problem area is fixing bolts protruding from items shipped into the factory from a sub-supplier. These will be damaged if not properly protected and handled. Bogies run from the very simple cast steel design (such as the traditional US three-piece freight bogie which is basically a pair of side frames and a bolster - see Bogies on this site) to very complicated fabricated designs with steel spring primary suspension, air bag secondary suspensions and both tread brakes and discs. Many decisions have to be taken in selecting the bogie appropriate for the role. Besides the suspension system and brakes, it is necessary to decide whether to use inside or outside bearings, solid or hollow axles, and to choose the wheel diameter and tread profile. Looking at a fabricated passenger vehicle bogie to explain the manufacturing process, the various parts that make up the side frames are assembled in a rotating jig and welded together and then moved to a new jig where the bolster or transom, depending on the type of bogie, will be welded in place. 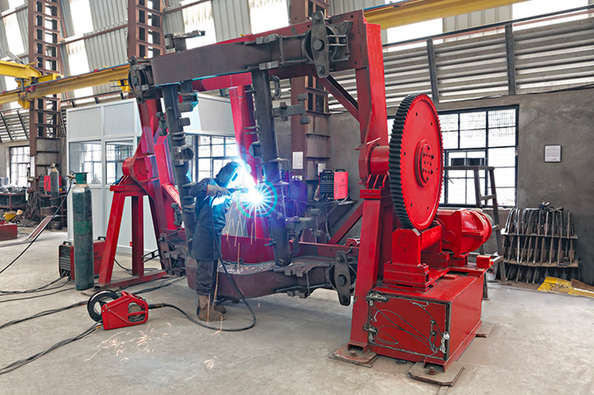 Figure 15: Bogie frame being welded in a purpose built manipulator to allow the frame to be turned into suitable positions for welding. High quality control systems must be in place for such work to ensure consistency and safety. Photo: Ved Sassomecanica. It is very important to have the "tram" of the bogie correct - that is the diagonal measurements taken from corner to corner - and special measuring equipment will be used to ensure the bogie frame is within tolerance before final welding takes place. Once the frame is manufactured, it is painted and then the externally mounted parts will be added. Normally, wheels and axles are bought as completed items and only need a minimal amount of machining work for assembly. The wheels will need to have the centres bored to suit the axle end diameter. This will be carried out on a wheel boring machine, which is a very big vertical borer with the wheel held in a large chuck. Once this task is complete, the wheel is taken to a wheel and axle press. This is a large horizontal press where the various items that make up the wheel and axle assembly will be pressed onto the axle. Besides the wheels, there may be brake disc centres, inside or outside bearings and gear wheels. Each of these items will be pressed on in turn. The fit is an "interference fit" and often there is an oil plug in the wheel to allow the injection of oil to assist in the pressing process. The oil is injected between the wheel and the axle to lubricate the mating surfaces during the pressing process. Not really applicable to this description but included for interest is that for removal of wheels there is often an oil plug in the wheel to allow the injection of oil to assist in the demounting process. The oil is injected between the wheel and the axle to lubricate the mating surfaces during the removal process. During assembly, records will be kept of the pressing process just in case there is a problem with the wheelset in the future. It is important during this stage to maintain the correct dimensions for the 'back-to-back' gauge. This is the measurement between the back face of the wheel flanges and it is necessary to ensure the correct fit is achieved otherwise there would be serious and embarrassing consequences when the completed vehicle is placed on the track. After pressing, the wheelset is transferred to a portal lathe where the wheel treads will be machined to ensure consistency of diameter between the two wheels. This does not apply to all assembly processes and will be dependant on the type of vehicle being manufactured. It is, however, very important on vehicles that use a mono-motor bogie design where high torque can occur on curves due to mis-matched wheel diameters. Bogie assembly now begins in earnest. If the suspension has chevrons, these will be the first items to be connected, if the suspension is using coil springs then that will be one of the last steps as the wheelsets are added. Next comes the air pipes, followed by the brake rigging, then the wiring and finally the wheelsets, culminating with the completed bogie undergoing a load test, which will ensure that the suspension is installed correctly and the bogie is functioning as designed. The steps described here could be in a different order depending on which item makes logical sense in the sequence, or to the particular bogie manufacturer's preference. If the bogies have electric motors and gears fitted, it is important to get the parts fitted with the correct tolerances. It takes a high degree of skill to set up the traction gearing when fitting a motor so that there is not too much or too little "give" between the gear teeth. This is referred to as a "backlash test”. 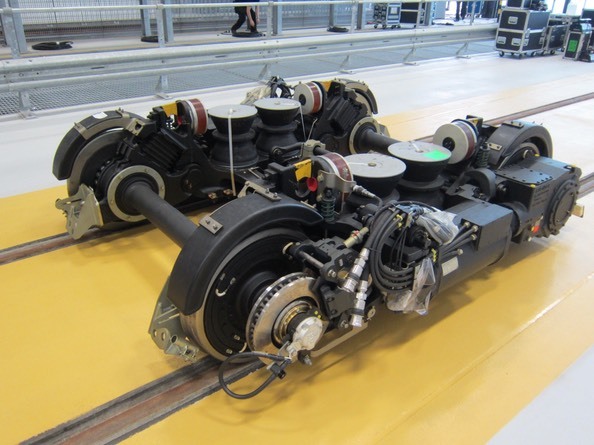 Figure 16: Completed Bombardier Flexx 3000 motor bogie as built for the new Blackpool trams. Photo: Author. There can be a considerable amount of wire in a rail vehicle and it is important to ensure that the wires are all running from point to point along the most economical route. At the same time, to make life easier for the maintenance department, all wires should run as close together as possible. The only exception to this is that high voltage wiring will be kept away from communications wiring or safety sensitive cables. Wiring is assembled in looms off of the vehicle; in fact, very often, wiring looms are a contracted out item. On modern rolling stock where more consideration has gone into the maintainability of the vehicle, a cable tray arrangement will be used to run the length of the vehicle with arms extended out at convenient locations along the main tray (see the picture below). The wires will be colour coded and/or numbered at regular spacing along the loom, or tray, to ensure the wire is identifiable for connection during assembly or replacement during the life of the vehicle. Similarly to the wiring there can be a considerable amount of piping on a vehicle and it can be advantageous to assemble some of the runs of the piping away from the vehicle. This will be performed in the pipe shop (where else? ), where the lengths of pipe will be cut, threaded on the ends and connectors applied to suit, maybe with a few off-shoots (branches), as required. These will then be delivered to vehicles for installation, either during underframe invert or in the fitting out shop. Once the body shell is complete, our vehicle is sent to another shop for fitting out. In steam locomotive days, this was known as the "Erecting Shop" and there are still some workshops where the name has stuck. It may pay a visit to the paint shop first or, as is increasingly common, some of the bodyshell parts may have been painted before assembly - depending on the method, of course. You could say it is starting to get interesting now. At last our vehicle will start to look like a piece of rolling stock. While it is in the fitting out area, it will move from station to station to receive the various fittings that make it a complete vehicle. Of course, not all manufacturers follow the same format for assembly but the following description is a typical method for final assembly of a vehicle. Equipment may not necessarily be installed in this order, although you will observe there is a fairly logical progression. Bodyshells will line the shop sides running longitudinally through the shop. In the first station area there will be an opportunity to weld on the secondary structures (mostly brackets) that the DO has found necessary but did not have sufficient information available when completing the design to include during manufacture in the bodyshell shop. Secondary structure is used to attach interior equipment panels or the body linings. At this stage, any interior insulation to go into the walls, roof or floor will be installed along with any hidden wiring or piping. It is also a good time to hang the doors and door gear as there is minimal other equipment around to interfere with the installation. Whilst this is going on inside, underfloor equipment can be welded or bolted on below the bodyshell, unless the "invert" method of assembly has been adopted. Dependant on what type of vehicle is being manufactured, this stage will include battery boxes, low voltage power supplies, chemical toilet retention tanks, brake resistors, HVAC and brake equipment, to list but a few. 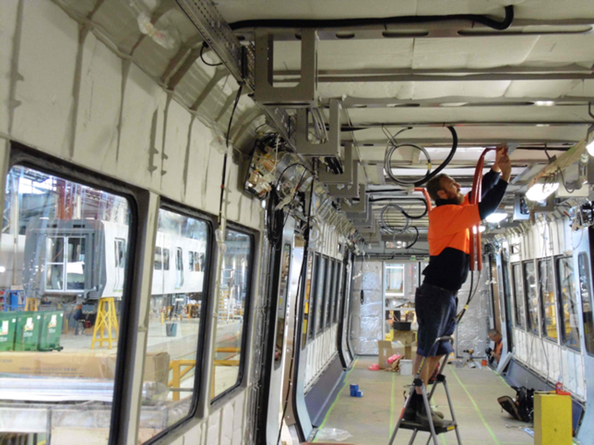 At the second station, wiring will commence in earnest with the installation of control cubicles and electrical boxes and possibly the driver's compartment equipment and lighting. Moving on, we will next see the installation of windows, gangway connections, interior panels and flooring (which may be a vinyl or carpeting). From now on, care has to be taken not to dirty the interior, so protective covering will be installed. At this point, handrails and maybe the seats will be installed. If the HVAC unit is roof mounted, this may now be craned in and installed. If we now have everything complete, we may now install our roof lining. Outside, the coupler will be installed and our piece of rolling stock is almost complete. Now we are nearing the end and the car will be lifted on to its bogies and electrical and mechanical connections made. At this point, there will be a final check through the vehicle and clean out remaining debris. Once this is done, the vehicle is handed over to the testing department to complete all the integration tests described below. Final cleaning and removal of protective covers will not take place until all the testing, and probably the commissioning, has been completed. Too early removal of protective covers leads to possible claims from the customer for scuffing or ingrained dirt and subsequent costly rectification by the manufacturer. Assembly Methods - Lift or Roll? Two different systems are used for vehicle fitting out. The older system has each unit in production standing in a fixed place with the equipment brought to it until all is installed. When all work and some basic testing is done, the unit is lifted up and over the other vehicles to where it will be landed on its bogies. Its bogies are "plumbed in" and it is then towed out to a test bay for the required verification tests. The space left by its lift is filled by another body shell unit which go through the same process until fully fitted out. The other system adopts the rolling production line system, where each unit is passed through the shop in a set sequence, beginning at the entrance to the shop and finishing at the exit as we saw above. Sometimes, two or three lines might be created, so that a unit will pass down the shop on the first line, back up on the second and down again on the third. The advantage of this system is that all vehicles must be kept on the move to ensure production continues smoothly. If a problem arises, it must be fixed quickly, otherwise the whole production line is delayed. It encourages people to get things done. However, it may make people rush and it does require strict quality control, otherwise, units show up a lot of problems during testing and a whole team has to be kept in the test bay doing rectification work. The static method solves these problems but it can lead to a unit with a problem staying in the shop long after it is due to leave. People tend to get on with other things and leave the difficult one waiting for a spare part. This system also requires a workshop with sufficient height clearance to allow a complete vehicle to be lifted over the others in the shop. Nowadays, the production line method is the more popular. The assembly process described above relates to multiple unit passenger trains. Locomotives are somewhat different but only as far as the procedure for the installation of equipment. Usually, the diesel engine, alternators, inverter units, blowers, compressors and other large items are lowered through the roof of the locomotive. This means that the roof will be one of the last items to be fitted. It is often arranged to be mounted in sections so that it can easily be removed for maintenance access. 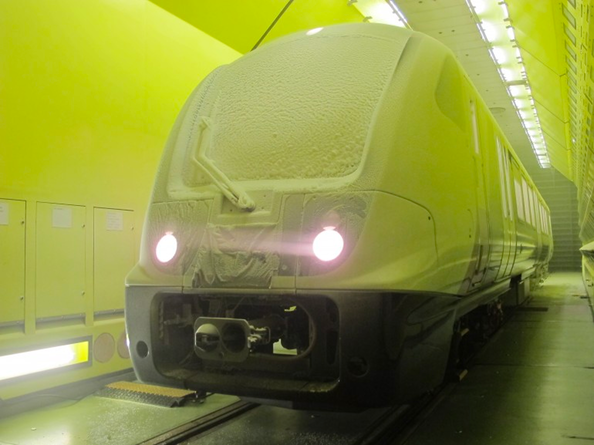 Figure 17: Crossrail Class 345 EMU car in the Vienna climate test facility. Photo: Crossrail. It is fairly obvious that, once the train starts coming together, testing will start but, in reality, it starts a lot earlier in the manufacturing process. An example is the combined test, where the propulsion kit is all laid out on the lab floor, including converters, motors, gearboxes, control system and even the ATP and ATO. The motors link into dynamometers which can also be set to motor, i.e. to simulate the kinetic energy of the train during downhill running or braking. The dynamometer excitation is controlled by a computer that is programmed to simulate the real load cycle of the railway on which the train will be used, though in the case of the Docklands Light Railway (London) traction equipment combined test at Preston, there was a range of "site data" available, from the Sishen-Sadhana ore line to the TGV SudOuest. Alstom went even further on the Eurostar, when they set up a whole train's worth of "informatique". The obvious advantage of combined test is that a lot of the interface and software debugging is done long before the train starts to appear on the shop floor. The "informatique" and propulsion hardware is less of a long lead item than the rest, yet the debugging can be even more painful than getting a Stanier "Jubilee" to steam freely. And, even if motors and gearboxes take longer to arrive than the propulsion cases, the latter can drive into dummy loads for the time being. Before a unit of rolling stock is accepted by the customer, there will be many formal tests to be performed. Each piece of equipment will be tested, before assembly into the train, first at the particular subcontractor's plant. This is usually referred to as a First Article Inspection (FAI) and will involve an inspector comparing the specification and drawings to the actual product in front of him. In the majority of cases, the piece of equipment will receive some form of dynamic test. This, for instance, could involve operating a gearbox on a test rig to verify it works correctly or maintains the correct temperature for the oil. If it is an electrical/electronic item, tests for continuity or breaker tripping and so on will be performed. 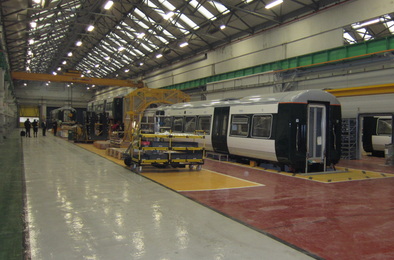 Figure 18: A GWR Class 387 4-car EMU in the new test shop at Bombardier factory in Derby UK. Photo: IRJ. Once all the FAI tests have been completed and passed as satisfactory on a particular item, the equipment can be sent to the vehicle builder for installation. When the rolling stock has been assembled, another series of tests will verify that the equipment functions as intended. There are both dynamic and static tests. Static tests will be used to verify such areas as the EMI (electro-magnetic interference) emissions or Hi-Pot testing or could be as mundane as testing the functioning of the lights or the raising and lowering of a pantograph. Some tests will seem mundane and will just be proving that lights work or the windshield wipers are working. Others have a more important function and will ensure that the wiring is correct through the vehicle or trainset, called trainline testing. If we are testing the cab controls then the power lever and the braking will be tested along with forward and reverse. All the warning and information lights will be checked for correct operation. Back in the vehicle tests will be carried out to prove the HVAC system is functioning correctly and heating and cooling as it is supposed to do. Also, if power is lost from the main supply, a test will ensure that the emergency back-up battery works and that power load is reduced by shedding over a set period of time to reduce the load requirement and, hence, current draw on the battery. Every piece of equipment will be tested on each piece of rolling stock and witnessed and approved by an Inspector appointed by the customer, before the rolling stock moves onto the next segment of the acceptance cycle, which is commissioning. All the tests have been completed and approved and now comes the interesting part, where the rolling stock is commissioned, usually on the customer's property. If it is a new piece of rolling stock or a trainset there will be a set of tests required called a performance evaluation. These tests will be used by the supplier to prove to the customer that what he is getting is, in fact, what he ordered. When the order was first placed, probably the first one or two items of rolling stock (or trainsets) would have been designated as prototypes or pre-production units. The intent here is to prove everything is in order before the supplier commences production of the remainder of the fleet. Commissioning tests will prove that all the pieces of equipment the supplier has purchased from the multitude of sub-suppliers have been integrated correctly and 'talk' to each other. It is obviously important that when the train driver issues a command, through his master controller, say to slow down, that the brakes apply and at the same time the propulsion system is not trying to accelerate the train. Oh yes, it has happened! Dynamic tests will be used to prove the acceleration and deceleration tests meet the specification performance criteria. Some contracts include an endurance or "burn-in" test when the vehicle will be tested and required to achieve a number of kilometres without a failure. If a failure occurs in this time the clock is stopped and the testing starts all over again. This arrangement is popular in the US. Delivery (in a contractual sense) occurs in two stages at two defined times. The first time occurs when the rolling stock is 'pushed out gate' which means, if the supplier is delivering by rail, pushing the train through the gate separating their property from the railway's. Nowadays, most deliveries occur by road, as manufacturers have such diverse customers, not just in their own country but around the world. Prior to this there is usually a ceremony where the manufacturer will hand over a key (for the master controller) or some significant symbol to the customer noting the delivery of the first item of his order. As each vehicle or train is shipped out and signed for by the customer, the contract has reached "substantial completion" for this unit. Vehicles being shipped by road or sea (even by air sometimes), need to be packed properly. It is usual to ship bodies and bogies separately. If the shipping involves a sea passage, careful protection is required for the body and parts vulnerable to damage by seawater or just the salty atmosphere. Bogies are packed so that the vibration of the suspension does not create wear. The shipping process invariably involves craneage and it is essential to ensure the docks know how to handle railway vehicles, which are very difficult to load on and off ships without damage. The delivery route must be surveyed to ensure that there are no obstructions. Often telephone or electricity cables are vulnerable and they are seldom in the places where the authorities think they are. A route plan may show where everything should be but there is no substitute for a thorough visual survey. Of course, permission and assistance will have to be sought from the local police. If traffic conditions require it, moves many have to be made at night. Once the equipment has arrived on the customer's property, final commissioning takes place. The second delivery stage, mentioned earlier, begins at the end of the commissioning when all tests have been signed as 'passed' and the customer is satisfied that he is getting what he paid for. This delivery usually occurs at the customer's maintenance facility and signifies that the rolling stock is ready for revenue service. Now the warranty clock begins to tick.